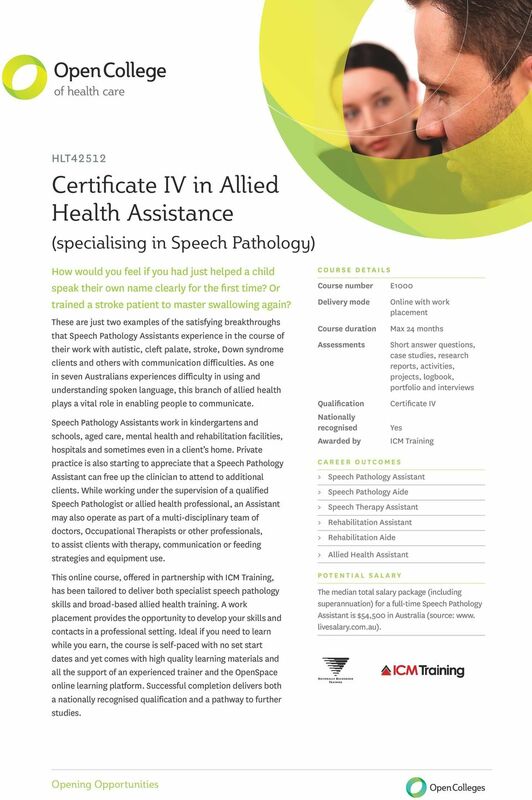 Download "Certificate IV in Allied Health Assistance"
3 of health care HLT42512 Certificate IV in Allied Health Assistance (specialising in Speech Pathology) How would you feel if you had just helped a child speak their own name clearly for the first time? Or trained a stroke patient to master swallowing again? These are just two examples of the satisfying breakthroughs that Speech Pathology Assistants experience in the course of their work with autistic, cleft palate, stroke, Down syndrome clients and others with communication difficulties. As one in seven Australians experiences difficulty in using and understanding spoken language, this branch of allied health plays a vital role in enabling people to communicate. Speech Pathology Assistants work in kindergartens and schools, aged care, mental health and rehabilitation facilities, hospitals and sometimes even in a client s home. Private practice is also starting to appreciate that a Speech Pathology Assistant can free up the clinician to attend to additional clients. While working under the supervision of a qualified Speech Pathologist or allied health professional, an Assistant may also operate as part of a multi-disciplinary team of doctors, Occupational Therapists or other professionals, to assist clients with therapy, communication or feeding strategies and equipment use. This online course, offered in partnership with ICM Training, has been tailored to deliver both specialist speech pathology skills and broad-based allied health training. A work placement provides the opportunity to develop your skills and contacts in a professional setting. Ideal if you need to learn while you earn, the course is self-paced with no set start dates and yet comes with high quality learning materials and all the support of an experienced trainer and the OpenSpace online learning platform. Successful completion delivers both a nationally recognised qualification and a pathway to further studies. COURSE DETAILS Course number Delivery mode Course duration Assessments Qualification Nationally recognised Awarded by E1000 Online with work placement Max 24 months Short answer questions, case studies, research reports, activities, projects, logbook, portfolio and interviews Certificate IV Yes CAREER OUTCOMES ICM Training > Speech Pathology Assistant > Speech Pathology Aide > Speech Therapy Assistant > Rehabilitation Assistant > Rehabilitation Aide > Allied Health Assistant POTENTIAL SALARY The median total salary package (including superannuation) for a full-time Speech Pathology Assistant is $54,500 in Australia (source: www. livesalary.com.au). 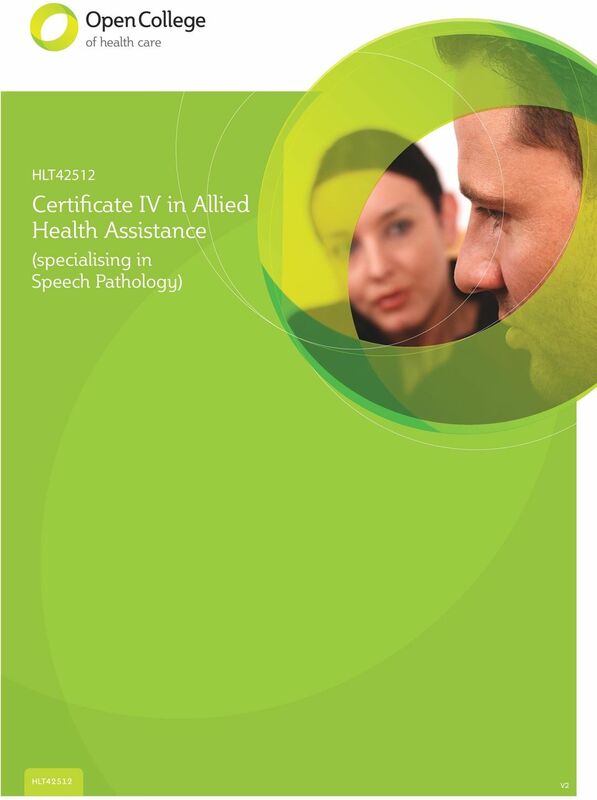 6 HLT42512 Certificate IV in Allied Health Assistance (specialising in Speech Pathology) > A qualification at Certificate II level or higher OR > 2 years of industry experience in a role that requires the use of written documentation and communication. Minimum Age Requirements You will need to be at least 16 years old. If you are under 18 your enrolment form will need to be signed by a parent or guardian. English Language Requirements This course requires you to read comprehensive learner workbooks, undertake a range of written assessments and engage in online discussion forums. Furthermore, the course relies on the extensive use of written communication. You will also require a level of English proficiency to operate in a health environment while undertaking work placement. As such, entry to the course requires English proficiency to Year 10 level, or equivalent (see Education Requirements for equivalency) or completion of an approved English language test (see website for details). Computing Requirements You will need access to a computer and the internet and have basic computing skills. Minimum specifications for your computer are: > Microsoft Office 2007 or equivalent > Broadband internet connection > 2GB of RAM > CD-ROM or DVD drive > Adobe Reader X or equivalent Specific requirements for Windows users: > Microsoft Windows XP or higher (Windows 7 or higher is recommended) > 1 gigahertz (GHz) or faster processor (2GHz or faster recommended) > Adobe Flash Player 10 or higher Specific requirements for Mac OS users: > Mac OS X v 10.5 or higher (Mac OS X v 10.6 or higher is recommended) > 1 gigahertz (GHz) or faster Intel processor (2GHz or faster recommended) You will also need access to a printer and scanner. Audio-Visual Requirements You may need access to a digital video recording device and/or a digital camera and associated software to save and upload video and image files to OpenSpace. Many mobile phones and smart phones include this technology. What support services are available? During your studies with Open Colleges, you will have access to a comprehensive range of support services. These include: Academic Support Your experienced Trainers and Assessors are available in OpenSpace to answer any questions you may have regarding the learning materials or assessments. Your Course Coordinator can also provide you with advice and support regarding the overall course. Student Support The Student Support Team is your one-stop service centre for all student administrative issues including enrolment, change of contact details, OpenSpace support, assessment results and certification. You can access the Student Support Team in OpenSpace or by or phone. Learning Support The Learning Support Team are a dedicated team of specialists that provide you with a comprehensive induction to studying with Open Colleges as well as specific support if you encounter learning difficulties during your studies. Learning support resources, such as writing guides, are available in OpenSpace. You can access the Learning Support Team via your Trainer and Assessor or the Student Support Team. Work Placement Support The Work Placement Support Team can provide you with support, advice and resources if you encounter difficulties in securing a workplace for your work placement. 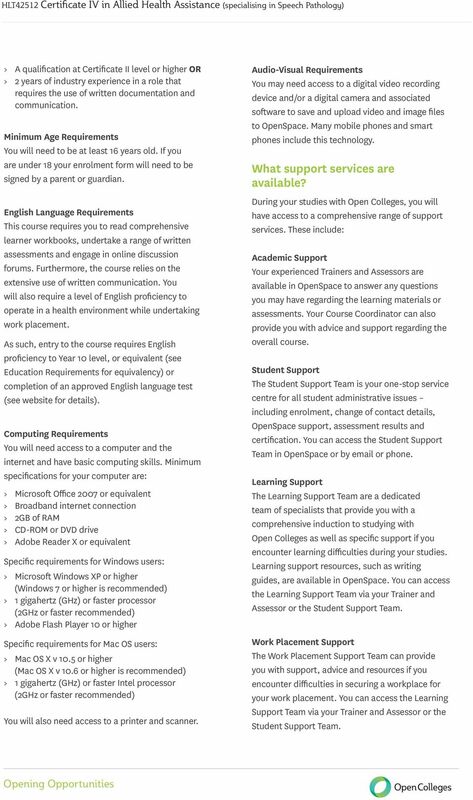 You can access the Learning Support Team via your Trainer and Assessor or the Student Support Team. 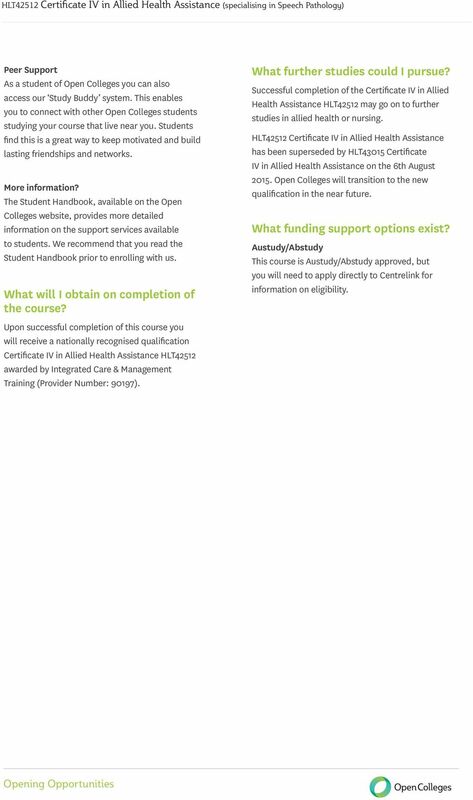 7 HLT42512 Certificate IV in Allied Health Assistance (specialising in Speech Pathology) Peer Support As a student of Open Colleges you can also access our Study Buddy system. This enables you to connect with other Open Colleges students studying your course that live near you. Students find this is a great way to keep motivated and build lasting friendships and networks. More information? 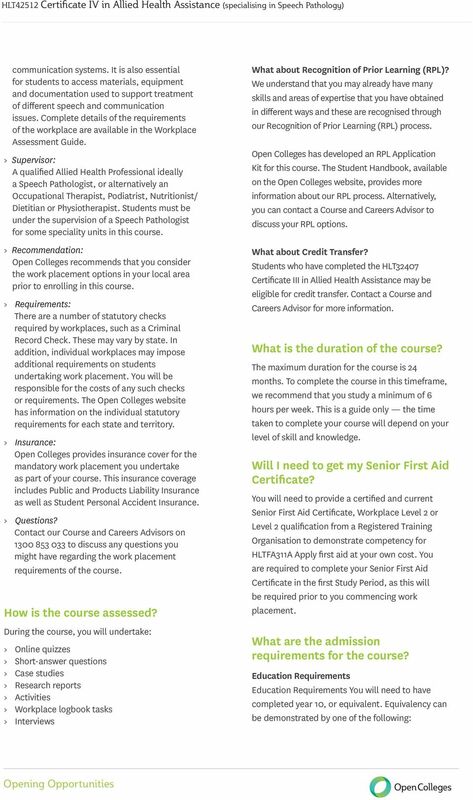 The Student Handbook, available on the Open Colleges website, provides more detailed information on the support services available to students. We recommend that you read the Student Handbook prior to enrolling with us. What will I obtain on completion of the course? Upon successful completion of this course you will receive a nationally recognised qualification Certificate IV in Allied Health Assistance HLT42512 awarded by Integrated Care & Management Training (Provider Number: 90197). What further studies could I pursue? Successful completion of the Certificate IV in Allied Health Assistance HLT42512 may go on to further studies in allied health or nursing. 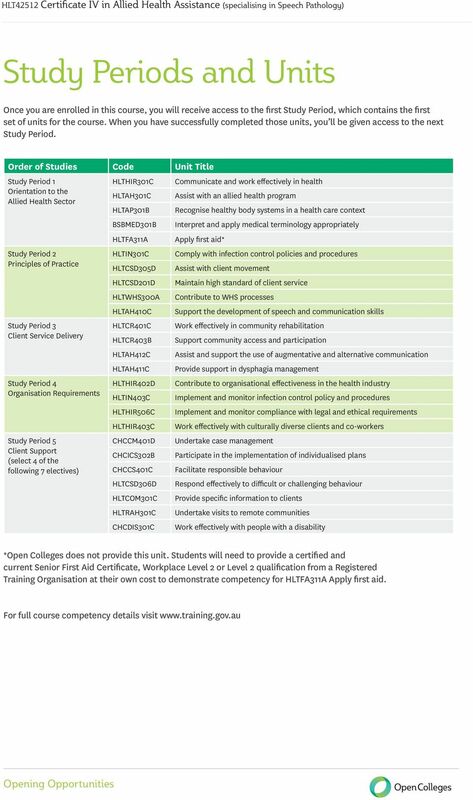 HLT42512 Certificate IV in Allied Health Assistance has been superseded by HLT43015 Certificate IV in Allied Health Assistance on the 6th August Open Colleges will transition to the new qualification in the near future. What funding support options exist? Austudy/Abstudy This course is Austudy/Abstudy approved, but you will need to apply directly to Centrelink for information on eligibility. 9 About Allied Health Allied health is an emerging industry sector and job roles for allied health At workers Open are Colleges, expected we to are steadily passionate increase health about professionals helping people from require all more walks skilled of life assistants to achieve their to support aspirations the demands and dreams. of their For workload, due in part to an ageing more than 100 years, we have been population. As the need for specialist opening care increases, opportunities health care for facilities people across look for Australia. employees Today, with the Open right Colleges qualifications. is blazing a new trail in online and distance education creating Allied health Australia s is a term leader that covers in next generation all the professions learning. involved in health care, apart from doctors, dentists and nurses. These professions may include physiotherapy, speech pathology, pharmacy, nutrition and dietetics, occupational therapy, podiatry and rehabilitation. 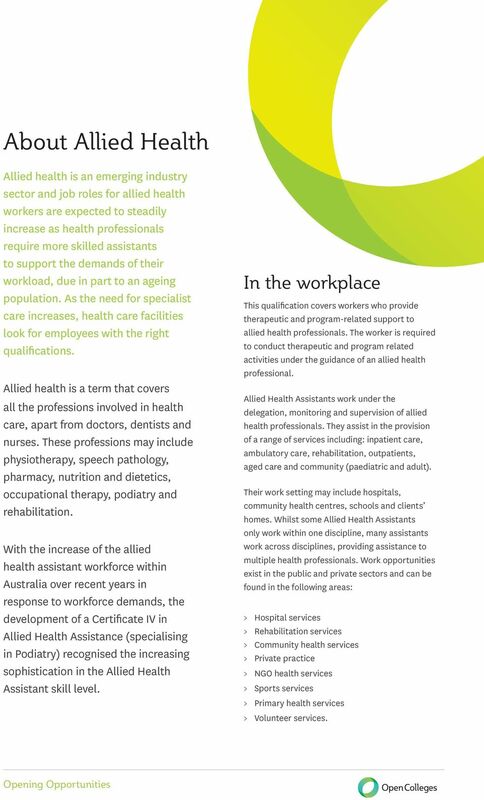 With the increase of the allied health assistant workforce within Australia over recent years in response to workforce demands, the development of a Certificate IV in Allied Health Assistance (specialising in Podiatry) recognised the increasing sophistication in the Allied Health Assistant skill level. In the workplace This qualification covers workers who provide therapeutic and program-related support to allied health professionals. The worker is required to conduct therapeutic and program related activities under the guidance of an allied health professional. Allied Health Assistants work under the delegation, monitoring and supervision of allied health professionals. They assist in the provision of a range of services including: inpatient care, ambulatory care, rehabilitation, outpatients, aged care and community (paediatric and adult). Their work setting may include hospitals, community health centres, schools and clients homes. Whilst some Allied Health Assistants only work within one discipline, many assistants work across disciplines, providing assistance to multiple health professionals. Work opportunities exist in the public and private sectors and can be found in the following areas: > Hospital services > Rehabilitation services > Community health services > Private practice > NGO health services > Sports services > Primary health services > Volunteer services. 11 Studying with Open Colleges Open Colleges provides you with the freedom to study where and when you want. We understand that our students are constantly juggling multiple priorities, so our unique learning approach has been specifically designed to enable you to fit education and training around your lifestyle. 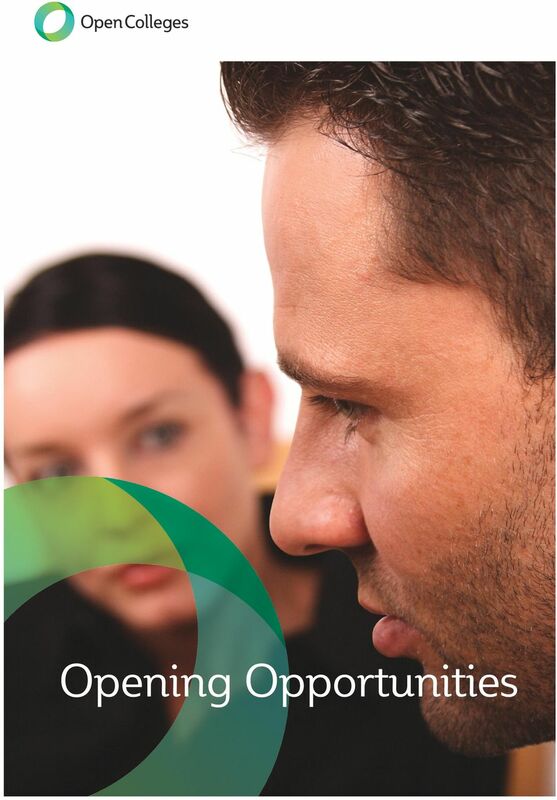 After you enrol with Open Colleges you will be provided with access to OpenSpace our cutting edge virtual campus. Here are some of the key features and benefits of OpenSpace: Access Access your learning materials, assessments, videos and additional online resources wherever you have an internet connection. You can also download your study guides, workbooks and assessments so that you can study wherever and whenever it suits you. Support Access the student support team using the online enquiry feature. OpenSpace also provides a detailed searchable database of Frequently Asked Questions, so that we can provide you with 24/7 responses to many of the common queries. You can also contact the student support team by phone on Studying at Open Colleges was the best decision that I ever made. It has opened so many doors already! Melissa Grey, Open Colleges Student Connections Connect with your trainers, assessors and other students. You can participate in the lively student forums, link up with a Study Buddy or engage with your trainer. OpenSpace is also where you will submit your assessments and receive your grades. Knowledge OpenSpace is your link to Gale our extensive online library. Through Gale you will have access to millions of academic, magazine and newspaper articles from around the world. 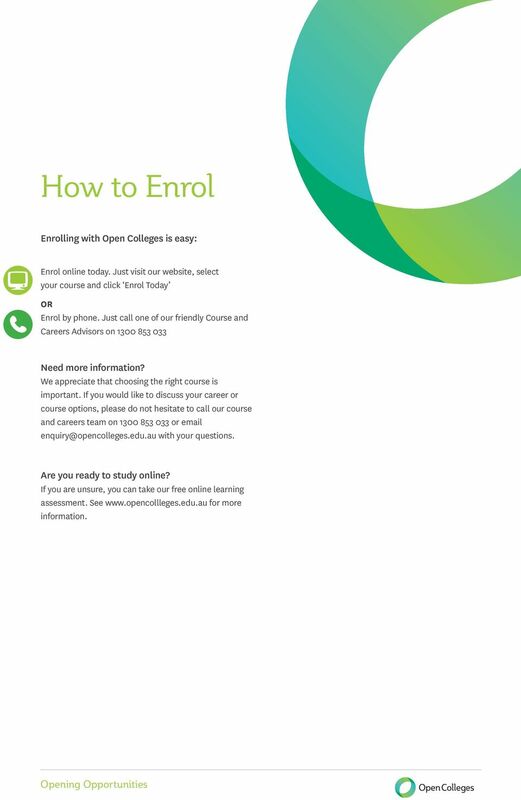 12 How to Enrol Enrolling with Open Colleges is easy: Enrol online today. Just visit our website, select your course and click Enrol Today OR Enrol by phone. Just call one of our friendly Course and Careers Advisors on Need more information? We appreciate that choosing the right course is important. If you would like to discuss your career or course options, please do not hesitate to call our course and careers team on or with your questions. Are you ready to study online? If you are unsure, you can take our free online learning assessment. See for more information.